My position on the Cord 810/812 is well-documented. It is also on solid ground. The combination of sheer, perfectly proportioned beauty, the ground-breaking futurism of the design that also successfully avoided lookiing weird, as many visionary designs do, along with the trump card of the Cord being the virtual brainchild of one single human being, Gordon M. Buehrig, other than the 'oily bits", which makes this machine the masterwork of a virtuoso, places it at the top of the heap. haha~~~~ don't know, but stand in my thinkding, it is the most beautiful, it is very special. Wait a minute whats that under the car a friggin kickstand? I still say that for me, it would be the '55-'56 Packard Patrician. Not only from a design standpoint, but also technological. Yes, the Citroen has the fabled hydraulic suspension, steering and brakes, the Packard had torsion-bar suspension, a limited slip differential and a wonderful automatic transmission. It just proves that even a company with very limited funds can produce innovative cars. How about a 1950 Abarth 205 Monza? Its not, the muira is.or the eagle speedster(e-type),or the alpha romeo 8C, or the koenigsegg ccx,or lastly the Joss JT1. 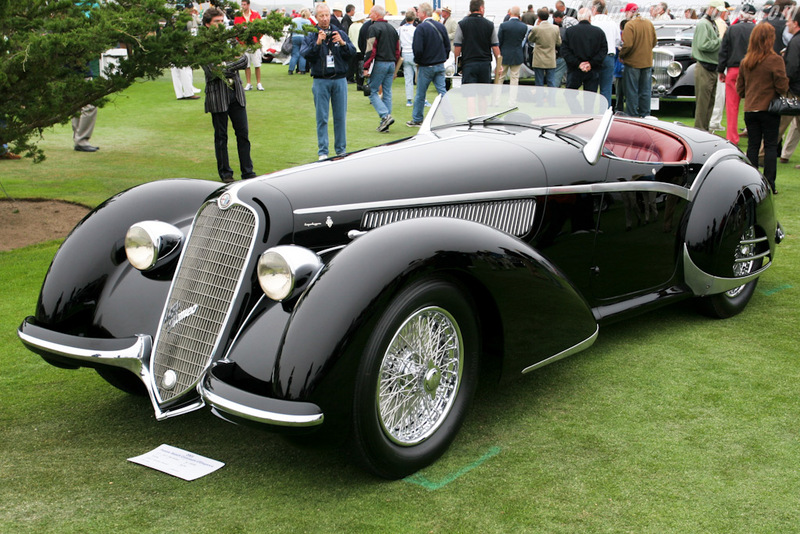 For me, it's the 1938 Bugatti Type 57 SC Atlantic, specifically, the black one that was painstakingly and meticulously restored by Ralph Lauren. Every time I see that car I instantly wonder what people thought when they saw that car in 1938. To me, it would be about as bizarre and breathtaking as seeing an F-16 fly overhead in 1940. Tough to pick only one... and some beautiful ones already mentioned here... I'll go with an Auburn Speedster 851/852. This car is IT !!!!! Anything before or after cannot measure up !!!!! !